1. Canon 70D DSLR Camera Body- I've been eyeing this baby for a long while now. This may just be the month it becomes mine. Filming makeup tutorials with a non auto focus video option has been quite the struggle until now. It is time to up my game! 2. Loving Tan tanning mousse- Mousses are my tanning product preference. I've used the St. Tropez one for ages and I'd love to see what this one is like. General beauty opinion says it's fabulous. 3. A 2017 Planner- 2016 will be over before we know it. I need a new blog planner because I plan all of my posts about a month in advance of writing, photographing and finalizing them. 4. Benefit Air Patrol Eyelid Primer- Katy/Luste Lux uses this one alot and I've been on the hunt for a new eyelid primer to try. I'm thinking this will be my next one. 5. Silk Flowers in a vase- Flowers are a girls best friend. Ones that do not die and always look pretty, even better! 6. Multicolor Feather Earrings- I'm obsessed with everything feathers at the moment! 7. Marc by Marc Jacobs Bow earrings- How precious are these? 8. Steve Madden Valko Multicolor Reptile Pump- I love funky shoes and these are going to work with one of my party dresses really perfectly! 9. Colored Pencils- Coloring is one of my favorite ways to relax. Read more about that in my Hobbies for Happiness Adult Coloring Book post. One thing I have yet to purchase is some really good colored pencils. 10. Morphe Brushes R12- Deluxe Highlight Fan Brush- I'm working on my next Morphe Brushes order and this is already in my cart. I need a new fan brush and on top of that this one is rose gold! 11. Dapper Emerald Velvet Sofa- When we purchased our white leather couch I absolutely loved the simplicity of it but was torn between it and a velvet purple sofa. Now emerald is on my mind and it will go great with my grey paint shade too. Decisions! 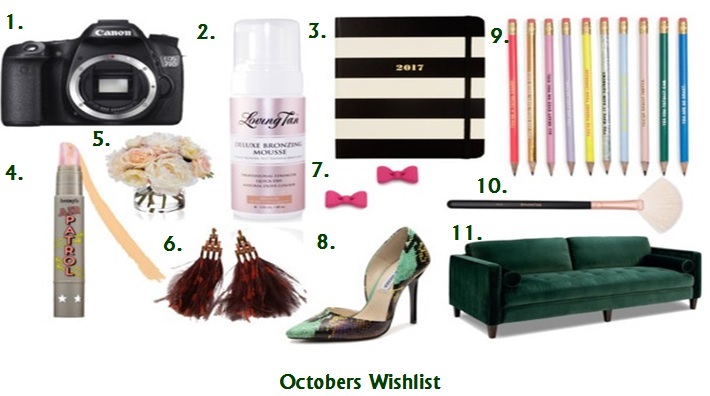 I hope you enjoyed getting to see what's on my wishlist for the month! Let me know what's on yours in the comments form!